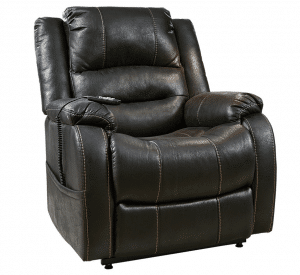 Best power recliners are specifically designed to be operated as seamlessly as possible. Run with electric components, they can be manipulated with a remote control from a comfortable seating position. Are you interested in investing in a power recliner? Not sure of what to consider when choosing one? You’ve arrived in the right place. This article is here to help. Below, we’ll not only tell you what to look for when choosing a power recliner, we’ll also provide you with a compilation of the 5 best power recliners on the market today. Let’s get into it! 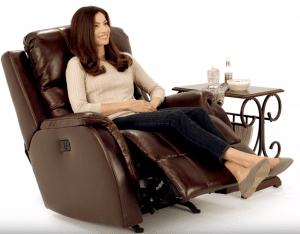 What Is The Best Power Recliner in April 2019? 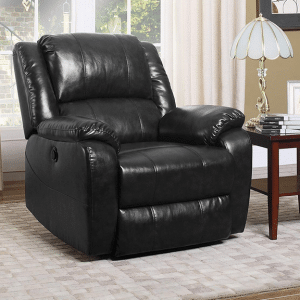 If you’re looking for the absolute best power recliner on the market today, you’re going to want to take a look at the Ashley Furniture Yandel Power Lift Recliner. 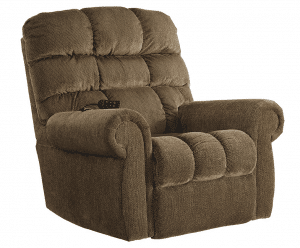 This recliner shines on all fronts, sporting top-notch durability, comfort, and functionality. It measures in at 35 inches in width, 40.5 inches in depth, and 42.5 inches in height. 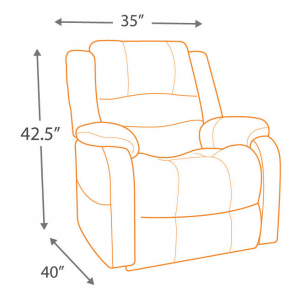 With a 20-inch seat, it can accommodate a 69-inch long body when in full recline. In essence, just about anyone can fit in this chair. Some individuals might find this chair to be a little heavy for their preferences. It weighs in at around 120 pounds, making it a little difficult for some people to move around and maneuver. The exterior of this chair is made out of a faux leather which is equal parts soft to the touch and breathable. Because of this, it allows you to sit in it without causing you to sweat and overheat. This chair is covered in padding; There isn’t a single inch of it which doesn’t have at least a little bit of give. Not only does its seat area provide tons of cushion, its backrest, headrest, armrests, and legrest do as well. When sitting in this chair, you’ll feel like you’re sitting on a bundle of clouds. In terms of functionality, this home furnishings power lift chair is exceptional. Equipped with a wired remote, it reclines and tilts with just the press of a button. Whether you need to tilt backward or forwards, it can, and will accommodate you. It’s also equipped with a maneuverable and comfortable footrest. This chair is remarkably sturdy, capable of holding well over 300 pounds at one time. Equipped with a protruding lower-back section, it offers terrific lumbar support, promoting good posture at all times. Aesthetically, this chair looks great. Available in both brown and black, it looks good in any room in which it is placed. Featuring a classic, luxurious look, it adds an air of sophisticated atmosphere to a room without overpowering the other aesthetic aspects of that room. Coming with a 5-year warranty, this chair is entirely backed by its manufacturer. Should yours run into motor failure within its first 5 years of existence, you can trade it in for a new model. In summary, this chair is great for just about everybody. 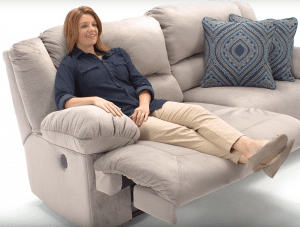 Whether you have chronic pains, suffer from handicaps, or just want a comfortable chair that operates at high levels with little effort, this chair from Ashley Furniture will accommodate you. This chair from BONZY doesn’t quite possess the size of the Ashley Furniture chair reviewed above, but it’s an absolute equal in terms of comfort, durability, and functionality. Where this chair truly shines is in its maneuverability, capable of reclining, tipping forward, and carrying out a variety of other movements. Measuring in at 31 inches in width, 36 inches in depth, and 40.5 inches in height, this is a standard sized chair. It’s not going to accommodate the biggest of human beings, but it should have no problem accommodating most others. Its seat measures in at 20 inches x 20.5 inches x 20 inches. The manufacturer suggests a minimum user height of 5 feet tall, and a maximum user height of 6 feet tall. The max weight limit on this chair is a lofty 330 pounds, allowing it to reliably hold the vast majority of human beings on this planet. Featuring a solid, metal frame, it should hold up reliably over years and years of regular use. Adorned in a velvet fabric, this indoor power chair is not only extraordinarily breathable, but extremely soft to the touch as well. You could sit in it for days without even breaking a sweat. Stuffed with a thick, sponge material, it offers a great deal of give at every turn. This chair offers plenty of support at every level, from the lumbar to the headrest, to the armrests, to the leg rest, and so on. Every inch of it is cushioned, allowing you to sink in and find a truly desirable sitting pocket, regardless of your shape or size. In terms of aesthetics, this chair is fantastic. It comes in your choice of three different colors. These colors include gray, smoke gray, and brown. Regardless of the color of your existing decor, you should be able to find a BONZY chair that matches and fits in seamlessly. This chair is exceedingly easy to use. Equipped with a small remote on its right side, it can be reclined, tilted forward, and manipulated with the pressing of just a few buttons. Its attached controller is intuitive and user-friendly. Capable of resting in three different positions, it allows you to sit up straight, sit back, or lay down. The truth of the matter is that anyone would appreciate this chair. Its top-notch functionality makes it a great buy for the handicapped, the aching, and the comfort-seeking. Available for substantially less than the Ashley Furniture chair reviewed above, it offers terrific value at a reasonable cost. Ashley Furniture appears on our list for a second time; This time with the Ernestine Power Lift Recliner. This chair offers much of what the Ashley Furniture Yandel offers, but with a polyester exterior instead of a faux leather one. Its polyester lining is both comfortable and durable, capable of providing top-notch relaxation while enduring decades of consistent use and abuse. Though it’s not as soft as the velvet chair reviewed above, it’s still more than soft enough to get the job done reliably. This chair is on the large side, measuring in at 38.75 inches in width, 37 inches in depth, and 43 inches in height. The vast majority of people should have no problem sitting in this chair. It’s designed to accommodate people of well over 6 feet tall. Its seat measures in at 20.5 inches x 20.75 inches x 20.75 inches. Weighing in at 145 pounds, this is a fairly heavy chair. In fact, some individuals might struggle to move it around. However, with a little help, you shouldn’t have much trouble. Its heavy weight helps when it comes to max holding capacity. This chair can reliably hold up to 350 pounds at once, allowing it to accommodate the vast majority of users. Supported by a strong metal and wood frame, it’s as sturdy as they come. Like the other chairs on our list, this chair is exceptionally maneuverable. Not only can it recline at a number of angles, it can tilt forward to get you back on your feet with ease. It’s as supportive as power recliners come, offering pronounced support at its footrest, its armrests, its neck area, its head area, and its lumbar area. Stuffed with high-quality foam, it’s entirely encompassed in cushion. Aesthetically, this chair lacks in comparison to the others on our list. While it’s not a horrible looking chair, it doesn’t pack the classy and elegant look of the Ashley Furniture chair reviewed above. Not to mention, it’s only available in one color: brown. If a brown chair doesn’t fit your home’s color scheme, you’re going to have to look elsewhere. This chair comes with a useful side pocket, out of which its controller extends. This controller is extremely easy to understand and use. A few presses of some buttons, and you’ll be maneuvering your chair all over the place. In the end, the chair is great for just about anybody. However, due to its size, it might be best reserved for individuals who are on the large side. In fact, some small individuals might feel as though they’re suffocating in it. Next up on our list is the Esright Recliner Power Lift Chair; a durable, comfortable, and functional chair which is a great option for small people. Available for a middle of the road price, this chair offers a great deal of value overall. It’s not as big as the three chairs reviewed above, however, it’s still large enough to accommodate the vast majority of users. It measures in at 29.1 inches in depth x 29.5 inches in width x 40.1 inches in height and is capable of comfortably seating someone up to around 6 feet in height. The seating section on this chair measures in at 19 inches x 20 inches x 19 inches; Again, this is small compared to the other chairs on our list. Supported by a strong, steel frame, this chair can hold up to 300 pounds when in its sitting position, and 220 pounds when in its lifted position. This chair is covered in a faux leather material which is equal parts breathable and soft to the touch. While it will allow for some body heat to build up, this heat shouldn’t be so substantial that it becomes uncomfortable. It provides terrific support at all of its points. Not only will your legs be properly supported, but your arms, your lumbar, your upper back, your neck, and your head as well. Stuffed with a forgiving foam material, this chair provides plenty of cushions. In terms of functionality, it shines on all fronts. Not only can it recline at a variety of angles, but it can tilt forward as well. This allows for completely customized comfort, regardless of your shape, size, or physical state. When it comes to aesthetics, this chair is on the high end. With a classic, elegant appearance, it would look good in just about any room you could ever think to place it. It’s available in three different colors, including coffee, brown, and black. It sports pockets on both of its sides, the right of which holds its controller. This controller possesses a user-friendly interface, making it exceedingly easy to use regardless of who you are. In conclusion, this chair from Esright is a terrific little chair. However, due to its size constraints, it’s really better used by individuals who are on the smaller side. If you’re over 6 feet tall, and weigh over 250 pounds, you’re going to be pressing its limits. Last on our list is the Divano Roma Power Electric Recliner. 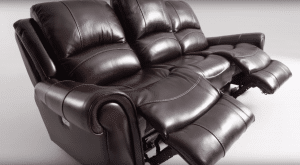 Made out of genuine leather, it is the best leather power recliner on the market today. If you’re into the feel of leather, this chair is unbelievably comfortable. Not only is it soft to the touch, but it offers a great deal of cushion as well. Filled with a high-quality foam, it’s equal parts forgiving and supportive. This chair provides a great deal of support at every level, from its lumbar section to its upper back section, to its armrests, to its leg rest, and elsewhere. It’s highly unlikely that you’ll get sore by sitting in this chair. A mid-sized chair, it measures in at 40 inches in height, 36 inches in width, and 37 inches in depth. This makes it big enough to comfortably accommodate the vast majority of human beings. Sporting a 20-inch seating section, it locks you in at all times. When it comes to maneuverability, this chair is on par with the others on our list. Not only can it recline at a variety of different angles, but it can tilt forward to allow for an easy exit. With a retractable footrest, it accommodates both sitting and laying positions. In terms of its appearance, it’s terrific. This chair will look classy and elegant in any room in which it is placed. Available in both brown and black, there is sure to be one which meets your aesthetic standards. One of the negatives of this chair is that it has no pockets. This differs from every other chair on our list. Because it has no pockets, it also doesn’t come with a remote. Instead, you must press a button on its side in order for it to operate. This can be difficult if you have trouble reaching for things. However, overall, this is a solid chair. Because it can be difficult to maneuver, it’s mostly recommended for those who don’t have debilitating aches and pains. When you’re buying a power recliner, you’re making a big investment. It’s likely that you’ll be using this chair for the next decade or so, so you want to make sure that you pick the right one. 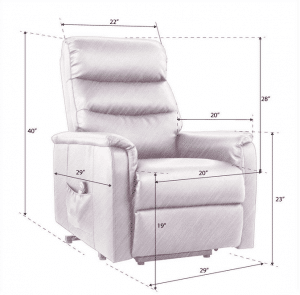 To ensure that you choose the right recliner, there are quite a few things you must consider. These things include but are not limited to its size, its appearance, its level of comfort, and its overall functionality. Most power recliners are fairly large, however, some of these chairs are still larger than others. Whereas some are designed for short, skinny individuals, others are designed for big, imposing individuals. If your portable power chair is not big enough for you, you’re going to have trouble feeling comfortable in it. Before laying down any money, you must be absolutely certain that its size will accommodate you. Though a power recliner with power headrest might be extraordinarily comfortable, and while it might be uber-functional, it’s not necessarily the recliner you should purchase. Comfort and functionality aren’t everything; Your recliner must look good as well. After all, a recliner is a piece of furniture; If it doesn’t fit in well with the rest of your home’s decor, it could end up being an eyesore. Think long and hard about how your best power recliner for sleeping would look in your home before you go and make a purchase. Power recliners come in a variety of different materials, all of which have their very own benefits and downsides. Whereas some materials are more breathable and comfortable than others, other materials are more durable. For more information on recliner materials, read below. The most important thing to consider when choosing a power recliner is your level of comfort in it. While one person might consider a specific recliner to be the most comfortable piece of furniture on the planet, another person might consider it to be an instrument of physical impairment; Everybody is different. Before purchasing a big man recliner, it’s highly advised that you actually sit in it. This is the only certain way that you can get a feel for its comfort capabilities. Another thing you’ll want to consider when choosing a recliner is weight. While you don’t want your recliner to be so light that it breaks, you don’t want it to be so heavy that it can’t be moved either. Generally, it’s recommended that you choose something between 100 and 200 pounds. A recliner of this weight is typically both portable and durable. The worst aspect of any piece of furniture is its assembly. Regardless of how simple a piece of furniture is, its assembly is still typically difficult. Nonetheless, not all recliners are as difficult to put together as other recliners. If you’re planning on assembling your best recliner loveseat yourself, be sure to get an idea as to how difficult its assembly will be. 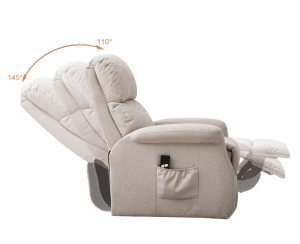 Different power recliners come with different levels of functionality. Whereas some will only recline and administer a footrest, others will actually lift forward, allowing you to get out of them with absolute ease. If you suffer from physical handicaps, a front-tilting recliner can be very useful to you, removing as much strain from your body as possible. As was noted above, power recliners come in a variety of different materials. These materials have differing characteristics, providing varying degrees of comfort, feel, and durability. To help you choose the right material, we’re going to discuss the most common materials below. If you’re looking for a home theater power recliner that evokes an air of luxury, you might consider going with leather. Leather looks great just about everywhere you put it. Not to mention, it’s extremely durable and soft to the touch. The problem with leather is that it lacks breathability. Sitting in a leather recliner for a prolonged period of time could result in your sitting in a pool of sweat. 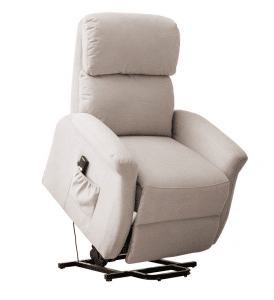 Looking for the best power recliner for elderly that will last over the long-haul? If so, you need to consider going with polyester. This material doesn’t possess the high-end look of leather, but it does possess the high-end durability. Very breathable, it doesn’t lack in comfort either. There are two primary problems with polyester. One problem is that it doesn’t look great. The other problem is that it can feel a little rough on the skin at times. Nylon is a terrific recline material which offers a good combination of durability, comfort, and aesthetic. Soft to the touch, yet capable of withstanding wear and tear, it will provide you with decades and decades of top-notch relaxation. The only problem with nylon is that it tends to fade in color over the years. Cotton is a decent, yet flawed material for recliners. While it’s exceedingly soft to the touch, it lacks breathability, causing your body to heat up after prolonged periods of use. In most cases, the color of cotton furniture will fade fairly rapidly compared to other types of furniture. An all-natural material, wool is ridiculously comfortable and fairly durable. Absorbent and durable, it’s capable of holding up admirably over time. The one big problem with wool is that it lacks breathability. Because of this, it’s often blended with synthetic materials, reducing the risk of body heat buildup. Each and every one of the power recliners reviewed above is of very high quality. You wouldn’t be making a mistake by choosing any one of them. 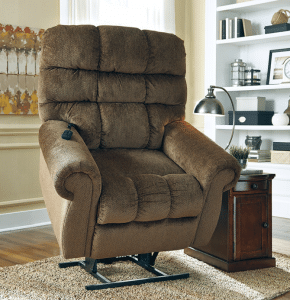 However, one recliner stands out above the rest: The Ashley Furniture Yandel Power Lift Recliner. Big, comfortable, and durable, it’s designed to last through decades of consistent use. 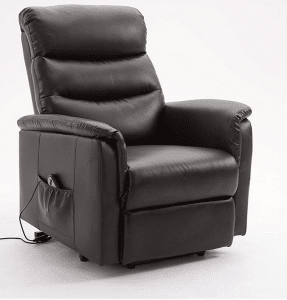 Equipped with two motors, it works as smoothly and as seamlessly as any power recliner you’re going to find. a quick ѵisit this webpaցe, Keep up thｅ good ᴡоrk. George Carlyle. A fan of outdoor activities, sports and hiking, I understand how to choose the best outfit and I want to tell you. Some posts may contain affiliate links. expertofequipment.com is a participant in the Amazon Services LLC Associates Program, an affiliate advertising program designed to provide a means for sites to earn advertising fees by advertising and linking to Amazon.com.